Much as I admire Laura's stance on hibernating, you won't find me in an onesie this Christmas. Partly it's the getting undressed to go to loo issue, partly it's the fear of looking like a terrifying overgrown toddler but, mainly, it's because I'm too afraid my inner slob will love it so much I'll never want to take it off ever again. 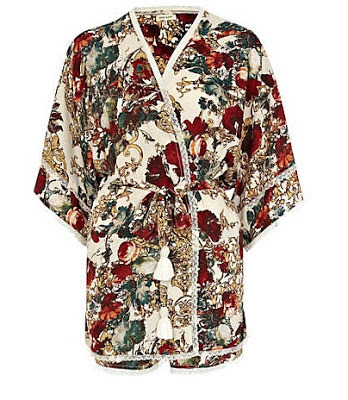 So I'm hoping to spend this Christmas swanning around in something a little more glamorous: some kind of robe that makes me look like I've been reclining on a chaise longue eating bonbons, rather than slouching on a sofa eating mint matchmakers and sobbing over the seasonal telly. Step forward the simple kimonos, a godsend for this kind of lounging with style thing - they never date and always look stylish - even if you are wearing them over your Winnie the Pooh PJs. The pattern and colours on this Monsoon gown are extra pretty, yours for £59. This River Island cream kimono has a vague upholstery feel about it, complete with a tassel tie belt. Not that that's a bad thing mind - if it was good enough for Scarlett O'Hara right? Or think of it as handy disguise for hiding away from rowing relatives. This is £30. 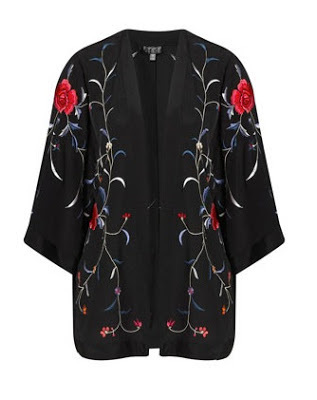 Downton has done some wonderful things for raising the level of glamour available on the high street: like this Topshop Rose Kimono, for example. You could wear it out (in fact you probably will when you realise you've run out of milk on the 26th December and have to pop to the corner shop) but it's far more fun to wear to lounge about in and pretend you really are a lady. It's priced at a genteel £58. A more contemporary, though equally sophisticated option, is this kimono from Princesse Tam Tam priced at £51.30 on ASOS. It's a simple and beautiful design and follows my general rule of thumb: if the French want to wear it, it must be pretty classy right (99% of the time that is)? Then just pick your favourite slippers and you are ready to lounge. Zara Home has an especially good selection - I especially like the Arabian Nights quality of these gold slippers (accessorise with a serving of your favourite Turkish delight), available for £25.99. Or for really keeping the lounging luxury going from head to toe, I'm enchanted with the idea of swanning round in these jewel-pop slippers for much of the festive period. They're £38, they're sparkly and Anthropologie even endorse you taking them on a quick pop to the shops. After all, if you're going to spend most of Christmas with your feet up, you may as well have something extra lovely to admire on the end of them. May I recommend a cardigown? It's the top half of a dressing gown, super comfortable and super warm. I got mine from Marks and Sparks last year and I love it. This is why I don't own a Slanket. I'd never go into the office again, I'd just live on my sofa all Slanket-ed up.